Very rare and specialized Donnie Darko t-shirt that expresses visually the beauty of the word cellar door. Inspired by the movie Donnie Darko. 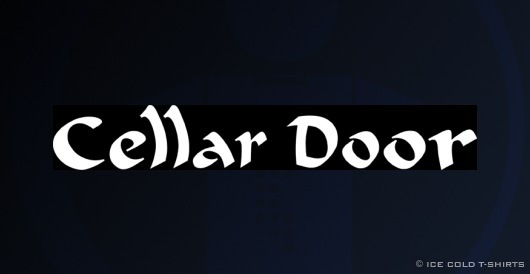 "...of all the endless combinations of words in all of history, 'Cellar Door' is the most beautiful." - As said by Karen Pommeroy in Donnie Darko. In reference to quotes by both Edgar Allen Poe and JRR Tolkien, author of Lord of the Rings.